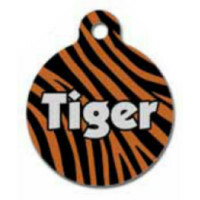 Our sublimation blank pet tags are made of high quality aluminum and have a glossy sublimatable finish allowing them to be imprinted with an image or photo to match the personality of any pet. Also a great way to uniquely display a pet's name and owner's contact information. Size: 1.25" x 1.5" x 0.045"
Imprint area: 1.25" x 1.5"
3/3/2016 – Are these tags double sided? I need to sublimate an image on one side, contact information on the other. Response From Enmart: The metal pet tags have one side that is white and sublimatable, and the other side is silver and not sublimatable; only engravable.